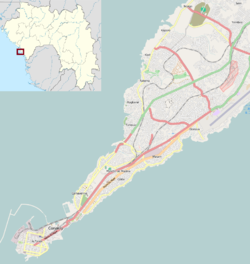 Conakry (pronounced /ˈkɑːnəkɹiː/; Sosso: Kɔnakiri) is the capital and largest city of Guinea. A port city, it serves as the economic, financial and cultural centre of Guinea. Its population as of the 2014 Guinea census was 1,660,973  Originally situated on Tombo Island, one of the Îles de Los, it has since spread up the neighboring Kaloum Peninsula. The current population of Conakry is difficult to ascertain, although the U.S. Bureau of African Affairs has estimated it at 2 million, accounting for one sixth of the entire population of the country. In 1970 conflict between Portuguese forces and the PAIGC in neighbouring Portuguese Guinea (now Guinea-Bissau) spilled into the Republic of Guinea when a group of 350 Portuguese troops and Guinean loyalists landed near Conakry, attacked the city and freed 26 Portuguese prisoners of war held by the PAIGC before retreating, having failed to overthrow the government or kill the PAIGC leadership. A street scene in Conakry. 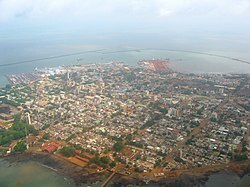 Conakry is Guinea's largest city and its administrative, communications, and economic centre. The city's economy revolves largely around the port, which has modern facilities for handling and storing cargo, through which alumina and bananas are shipped. Manufactures include food products and cement, metal manufactures, and fuel products. Periodic power and water cuts have been a daily burden for Conakry's residents since early 2002. Government and power company officials blame the drought of February 2001 for a failure of the hydro-electric supply to the capital, and a failure of aging machinery for the continuation of the crisis. Critics of the government cite mis-management, corruption and the withdrawal of the power agency's French partner at the beginning of 2002. As of 2007[update], much of the city has no traffic lighting in the overnight hours. According to Köppen climate classification, Conakry features a tropical savanna climate (Köppen climate classification: Aw). Conakry features a wet season and a dry season. Like a good portion of West Africa, Conakry's dry season is influenced by the harmattan wind between December and April. As a result, relatively little precipitation falls in the city during these months. ^ "GeoHive - Guinea population statistics". geohive.com. Archived from the original on 24 November 2015. Retrieved 5 June 2016. ^ For the urban infrastructure and its history, see M. Dian DIALLO. Street Addressing And Basic Services In Conakry, Guinea. Presented at the Urban Forum/ World Bank – Washington, D.C. – 2–4 April 2002. ^ "Cloudy Days in Conakry". Time. 7 December 1970. ^ Gomez, Alsény René (2010). La Guinée peut-elle être changée?. Editions L'Harmattan. ISBN 978-2-296-11963-5. ^ "Guinea massacre toll put at 157". BBC News. 29 September 2009. ^ "Guineeconakry.info – Conakry (la capitale)". Archived from the original on 28 March 2014. Retrieved 14 October 2014. ^ www.semantico.com. "Europa World Online : Log In". www.europaworld.com. Retrieved 29 January 2018. ^ Conakry's dark streets turning orange. James Copnall, BBC News, Guinea . 23 November 2006. Q&A: Guinea emergency, BBC World Service. 13 February 2007. Youths Chase Staff From State Electricity Offices, Protesting Power Cuts, 25 October 2007 (UN Integrated Regional Information Networks/All Africa Global Media via COMTEX). IRIN In-Depth, Guinea: Living on the edge. UN Office for the Coordination of Humanitarian Affairs, January 2005. Conflict history: Guinea Archived 15 July 2007 at Archive.today. International Crisis Group, updated 11 May 2007. ^ "Conakry Climate Normals 1961–1990". National Oceanic and Atmospheric Administration. Retrieved 6 July 2015. ^ Rev Fr Gynecol Obstet, Diallo MS, Diallo TS, Diallo FB, Diallo Y, Camara AY, Onivogui G, Keita N, Diawo SA. (1995) Mar;90(3):138-41., Anemia and pregnancy. Epidemiologic, clinical and prognostic study at the university clinic of the Ignace Deen Hospital, Conakry (Guinee), Clinique universitaire de Gynécologie-Obstétrique, Hôpital Ignace Deen, Conakry Guinée. ^ Young, Isabelle; Gherardin, Tony (15 July 2008). Africa. Lonely Planet. p. 411. ISBN 978-1-74059-143-0. Retrieved 16 March 2011. ^ Boone, Sylvia Ardyn (May 1974). West African travels: a guide to people and places. Random House. p. 139. ISBN 978-0-394-46154-0. Retrieved 15 March 2011. ^ Diawara, Manthia (2000). In search of Africa. Harvard University Press. p. 134. ISBN 978-0-674-00408-5. Retrieved 15 March 2011. ^ Auzias, Dominique; Labourdette, Jean-Paul; Gazel, Alexandra (7 March 2007). République de Guinée, Guinée-Bissau. Petit Futé. p. 65. ISBN 978-2-7469-1603-6. Retrieved 15 March 2011. ^ Jeune Afrique L'intelligent. Groupe Jeune Afrique. January 2004. Retrieved 15 March 2011. ^ a b Hudgens, Jim; Trillo, Richard (30 December 2003). The rough guide to West Africa. Rough Guides. p. 558. ISBN 978-1-84353-118-0. Retrieved 16 March 2011. ^ "Economie". Infoguinee.com. Archived from the original on 13 July 2011. Retrieved 16 March 2011. ^ Kalani; Ryan Camara (8 January 2007). World Rhythms! Arts Program Presents West African Drum & Dance: A Yankadi-Macrou Celebration (Teacher's Guide), Book, DVD & CD. Alfred Music Publishing. p. 114. ISBN 978-0-7390-3869-7. Retrieved 16 March 2011. ^ a b Worldmark Encyclopedia of the Nations: Africa. Gale Research. 1995. p. 189. ISBN 978-0-8103-9880-1. Retrieved 16 March 2011. ^ Schwarz-Bart, Simone; Schwarz-Bart, André (2003). In Praise of Black Women: Modern African women. Univ of Wisconsin Press. p. 121. ISBN 978-0-299-17270-1. Retrieved 16 March 2011. ^ Davidson, Basil (1989). The fortunate isles: a study in African transformation. Africa World Press. p. 104. ISBN 978-0-86543-122-5. Retrieved 16 March 2011. ^ GUINEA Dying for Change Brutality and Repression by Guinean Security Forces in Response to a Nationwide Strike. Human Rights Watch. p. 17. GGKEY:1UZAQCJ7E3A. Retrieved 16 March 2011. ^ Europa Publications (9 December 2003). Africa South of the Sahara 2004. Psychology Press. p. 520. ISBN 978-1-85743-183-4. Retrieved 16 March 2011. ^ Encyclopædia Britannica; inc (1993). The New Encyclopædia Britannica: Micropædia. Encyclopædia Britannica. p. 512. ISBN 978-0-85229-571-7. Retrieved 16 March 2011. ^ a b Devey, Muriel (2009). La Guinée. KARTHALA Editions. p. 230. ISBN 978-2-8111-0037-7. Retrieved 16 March 2011. ^ O'Toole, Thomas; Baker, Janice E. (2005). Historical dictionary of Guinea. Scarecrow Press. p. 112. ISBN 978-0-8108-4634-0. Retrieved 16 March 2011. ^ K G Saur Books (31 December 2006). International directory of arts. K.G. Saur. ISBN 978-3-598-23113-1. Retrieved 16 March 2011. ^ Böhme, Rolf (December 1991). Inventory of World Topographic Mapping: South America, Central America, and Africa. Published on behalf of the International Cartographic Association by Elsevier Applied Science Publishers. p. 344. ISBN 978-1-85166-661-4. Retrieved 16 March 2011. ^ "Etudes en Guinee" (PDF) (in French). Projet EtudiantGuinée. Archived from the original (PDF) on 26 July 2011. Retrieved 16 March 2011. ^ Bâ, Ardo Ousmane (1986). Camp Boiro. L'Harmattan. ISBN 978-2-85802-649-4. Retrieved 16 March 2011. ^ Bartke, Wolfgang (1975). China's economic aid. Holmes & Meier Publishers. p. 119. ISBN 978-0-8419-0179-7. Retrieved 16 March 2011. Wikivoyage has a travel guide for Conakry. 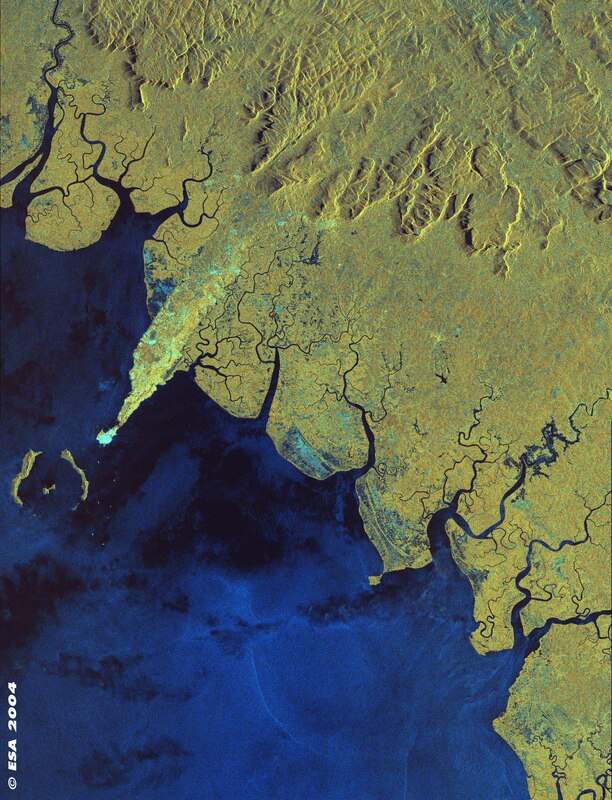 Satellite image of Conakry and the Kaloum Peninsula, from the European Space Agency's Envisat: image description at http://www.esa.int/esaEO/SEMAV21XDYD_index_1.html.